15 of Georgia's Best Winter Activities! Because it’s a southern state, a visit to Georgia in the wintertime generally yields sunshine and warm(er) temperatures than its neighbors to the north. That’s not to say that the Peach State doesn’t have its share of ice and snow, but for the most part, those events are few and far between. Jack Frost might nip at your nose a bit, but typically, Georgia only gets a few inches of snow each winter. So, what is one to do in all that warm, southern air? Here are a few ideas. You can’t beat the view at Rock City Gardens, located high atop historic Lookout Mountain. 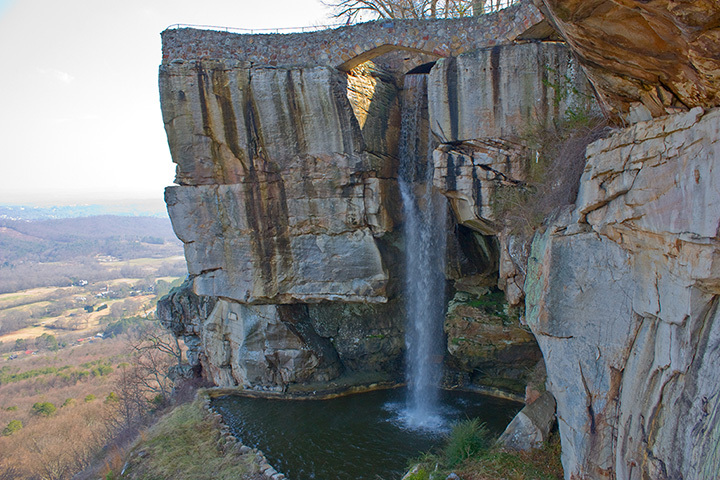 Opened to the public in 1932, Rock City has been inviting guests to “See Seven States” for decades. Remember those roadside barns painted with the famed “See Rock City” on the side? But there’s a lot more to the gardens than the scenic vistas and roadside barns. Garden gnomes, fairyland creatures, and Mother Goose characters await visitors along the Enchanted Trail. Each season, the “Citadel of Rocks,” as it was aptly called decades ago, hosts a spectacular event. During the winter, the garden is alight with 30 different holiday scenes and thousands of lights during the Enchanted Garden of Lights. Nightly entertainment, visits from the Ice Queen and Santa, and the wafting smells of homemade fudge, hot cocoa, and gingerbread cookies waiting to be decorated round out this award-winning event. Fainting Goat Vineyards and Winery has made a name for itself in the Jasper, Georgia area. Before you ask, there are currently no goats on the property, fainting or otherwise, though a few are due to arrive late this year. The owners chose that name because they felt that wine should be fun and whimsical, just like fainting goats. The winery, located at the foothills of the Appalachian Mountains, features a stunning view and the chance to taste four different wines for only $8. The 1812 is a Silver Medal Winner and one of their most popular wines. It’s a 50/50 cabernet/merlot blend with a fruit forward and medium body, offering dark berry on the palate. The Revere is 100 percent Blanc du Bois, a regional grape that turns out a white wine with floral and citrus notes on the palate. The winery hosts year-round events such as Winestock, a Woodstock-themed wine and music festival each July, a Kentucky Derby party in May, and live music every weekend throughout the year. Located on 54 acres in Cartersville, Georgia, the Etowah Indian Mounds Historic Site is the most intact Mississippian culture site in the Southeast. Inhabited since 1,000 A.D. and home to thousands of Native Americans over the centuries, only nine percent of the site has been excavated. What has been examined to this point offers incredible insight into a people rich in ritualistic culture and skilled in survival. The museum offers an informational film and showcases artifacts such as feathers, copper ear ornaments, and hand-carved, 125-pound stone effigies. This historic site was a political and religious center for Native Americans, and visitors can truly get a glimpse of how this early civilization lived. Six earthen mounds, a village site, plaza, defensive ditch, artifact museum, and more await history lovers at the Etowah Mounds. Open 365 days a year, there’s never a bad time to visit the Georgia Aquarium in Atlanta, with its 10 million gallons of fresh and saltwater. Opened in 2005, the aquarium’s most popular exhibit is Ocean Voyager Built by Home Depot. With 6.3 million gallons of saltwater and thousands of fascinating fish swimming around, it’s one of the largest single aquatic exhibits in the world. Incidentally, the Georgia Aquarium is the largest aquarium in the Western Hemisphere and the only aquarium in North America to house the world’s largest fish—manta rays and whale sharks—both of which can be found in the Ocean Voyager exhibit. For a hands-on experience, guests can find touch pools in the Ocean Voyager, Georgia-Pacific Cold Water Quest, and Aquanaut Adventure exhibits. The aquarium also offers dolphin, penguin and sea otter encounters as well as an interactive beluga whale program. Several events are hosted on-site throughout the year for animal awareness day and various holidays. Situated on 3,200 acres of beautiful land located just outside of Atlanta, Georgia, Stone Mountain Park has everything from interactive children’s attractions to nature walks. Featuring more than a dozen annual events, including Stone Mountain Christmas, the Yellow Daisy Festival, and the Country Living Fair, Stone Mountain has been entertaining visitors for decades. The carving of the famous faces on Stone Mountain began in 1923, but after many starts and stops, the final carvings were not complete until 1972. The faces on the mountain are Confederate Generals Robert E. Lee and Stonewall Jackson and Confederate President Jefferson Davis. The famed mountain carving is more than three acres wide and recesses 42 feet into the mountain. Visitors can see the mountain carvings several different ways: a hike up the trail, a sky ride to the top, or a scenic train ride around the mountain. During the winter months, Stone Mountain features Snow Mountain, with an assortment of family-fun activities like tubing, snowman building, and snowball shooting. Stone Mountain Christmas is also one of the more popular annual events, with two million lights, holiday music, and a nightly Christmas parade. Remember the good old days of diners and drive-ins? Well, those days are back in style at the Jesup Drive-In, the oldest drive-in in Georgia. Originally opened in 1948, the drive-in has been renovated to its 1950s glory days and features newly released movies and carhops dressed in period attire who will bring your concessions to your car. In 1890, the Chickamauga & Chattanooga National Military Park became the first of its kind to open in the United States. Dedicated in 1895, it’s one of the few parks whose monuments were placed by soldiers who fought on its battlefields. Since its dedication, it has served as national model for military and historical parks. The park consists of 9,000 acres and six distinct locations across the greater Chattanooga, Tennessee area, the largest of which is the Chickamauga Battlefield, located in Chickamauga, Georgia. The battlefield includes monuments, 50 miles of scenic and historic trails, and a large visitors center which features an orientation film and exhibits on the 1863 Battle of Chickamauga, a gift shop, and the Fuller Gun Collection. This impressive assemblage of military rifles and muskets includes pieces dating back to the colonial era. The park is open year-round and offers ranger-led tours as well as self-guided auto tours. Originally, the Museum of Aviation, located on Robins Air Force Base in Georgia, only had 20 aircraft on display and another 20 being restored. Today, it’s the second largest museum in the U.S. Air Force and the fourth most visited museum in the Department of Defense. With 51 acres of land, the museum includes four buildings which house 85 historic aircraft, missiles, cockpits, and aircraft-related exhibits. In addition, the Georgia Aviation Hall of Fame is also located on the premises. What was once a plantation in the 1800s and later a cattle farm is now the Birdsong Nature Center. Located in Thomasville, Georgia, on 565 acres of land, the center’s mission is conservation and education. The land is covered with hardwood and pine forests, dotted with ponds and swamps, teeming with wildlife, and bathed in the vibrant beauty of wildflowers. Birds and butterflies claim the airspace, while 12 miles of nature trails and an assortment of natural habitats beg to be explored year-round. Located in Cordele, Georgia, the SAM Shortline transports passengers back in time to the golden age of railroads. The 1949 vintage railcars provide a nostalgic atmosphere for riders as the train chugs from one quaint town to the next. The train is named in part for the original railroad company—the Savannah, Americus and Montgomery Railroad Company—that traversed the tracks that ran from Savannah to Alabama in the 1880s. The head of the railroad company was Colonel Samuel Hugh Hawkins of Americus. He is also part of the reason the SAM Shortline has its current name. The train route stops at different towns on different days, but each town is unique and offers fun and excitement to its visitors. Sometimes, the train departs from Cordele and at other times, it departs from the Georgia Veterans State Park boarding location. Have you ever laid in your backyard and just looked up at the night sky, peering from one constellation to the next? Did you know there’s actually an award for best places to stargaze? The International Dark Sky Association named the Stephen C. Foster State Park in Fargo, Georgia as a gold-tier “International Dark Sky Park.” The designation means the park’s skies have very little ambient light, so visitors can enjoy spectacular views of the moon, stars, planets, and comets. The State Botanical Garden (SBG) is one of Georgia’s hidden gems. Located in Athens near the University of Georgia, the SBG features guided tours of its extensive gardens and collections. The visitor’s center features changing plant displays of tropical plants, while the conservatory houses the Tropical Greenhouse Collection. The International Garden, Heritage Garden, five miles of trails, and natural areas offer more than enough trees, plants, and flowers to keep visitors enthralled for hours. The gift shop is also a must-see, as it features books on gardening, plants available for purchase, children’s games and gardening tools, artwork, and products handcrafted by local artisans. Pebble Hill Plantation was named around the 1850s, though the history of the property dates to the Georgia Land Lottery of 1820. The plantation has been owned by two great families during its existence, the second of which created a trust so the plantation would become a museum upon the death of its last owner. The museum has been restored to the period ranging from 1915 to 1960, the period in which the last owner’s major building projects, family traditions, and grand entertaining took place. Pebble Hill is called one of the state’s “Belles,” as its stately architecture, southern magnolias, and longleaf pines create a picturesque landscape of southern charm and beauty. Visitors can tour the Main House with its impressive art collection, voluminous library, and priceless antiques and then explore the 3,000-acre property which includes gorgeous gardens, a log cabin school, the swimming pool and tennis court, a fire house, and much more. Shops, restaurants, public artwork, and live entertainment await visitors to Underground Atlanta, one of the city’s oldest and most unique attractions. This “City Beneath the Streets” first reopened to the public in 1969 as a retail and entertainment center, only one year after the phenomenal restoration project began, during which much of the site’s original architecture, including ornate marble, granite archways, and decorative brickwork, were saved and restored. Underground Atlanta was closed for a few years during the construction of the local rapid transit line, but it redesigned to include a family-friendly atmosphere with special events and cultural programming added to the line-up of things to do. Listed on the National Register of Historic Places, visitors to Underground Atlanta can stop by the information booth to pick up a copy of the Self-Guided Walking History Tour Brochure to learn all about this fascinating venue. Doth thou enjoy good company, fine acting, warm food, and libations? If the answer is yes, the Shakespeare Tavern in Atlanta, Georgia is must-see. This unique theatre features a Globe-inspired balcony and Globe-inspired outdoor facade, so the exterior alone is worth the trip. If you’ve never seen Shakespeare performed live (or even if you have), the Shakespeare Tavern does it right. Other playwrights’ works are performed here as well, and each of them is performed by what the Tavern calls its “Original Practice,” which basically means that each show will be performed the way the playwright intended, alive and in a voice that every audience member can understand and enjoy. The Tavern offers before-the-show dinner and drinks at the bar. Check out the menu, which features an assortment of delicacies like The King’s Supper Sandwich, Shepherd’s Pie, and a Cornish pastry.